President and Sister Merrill at the Airport...Going Home! This will be my last report home as I leave on Wednesday!! We played soccer this morning and went straight to the Internet café so I don’t have my memory card with the pictures…it will have to happen when I get home. There is really no one that can cut hair well here and no once in our house cuts hair so I think I will ask Sister Merrill tomorrow if she has time to give me a haircut. I was thinking of just getting one right when I got home, a nice one before my homecoming talk, because I don’t want the buzz cut they give here. I can’t wait for all those appointments that are set up, doctors, Orthodontist and Dentist! Should be great and hopefully they wont find any diseases! You are not going to believe that I finally got the Christmas package that you sent in November…now February! It was a big one so I will give what I can away. Some of the native Elders scrambled through it and took some stuff out so its going to good use. 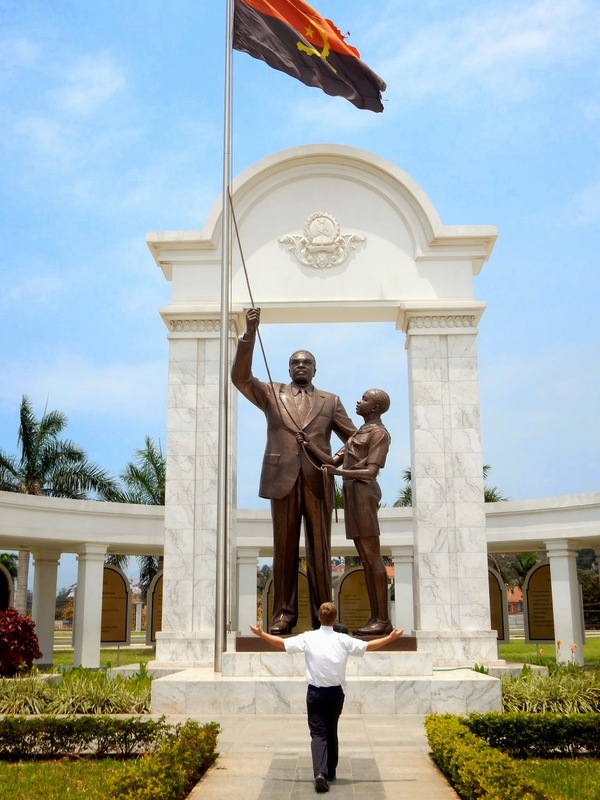 Yes, I already gave away the suit and all the ties and I’ll just leave my clothes and other stuff for everyone of the natives here or Angolans. I am going to try and get some sand from the beach before I leave. Sorry so short, I will see you soon! Visit from Luisa from Lubango...Zone Conference... New Comp. Elder Yeanopolus! Hi Family and friends! I have really enjoyed worked with Elder Yeanopolus and things are going great and we are working hard. This area is big and we are walking everywhere and we walk on sand all day long. We are teaching some cool people like Geraldo and Linda who are just finishing up with their documents for Marriage and want to get baptized, Geraldo left the province to his birth province to get his documents, we are hoping for a miracle so that they will be able to get the paperwork so they can be baptized soon. Nelo, he has been investigating the church for the past 6 months, he has a strong testimony. He is trying to get permission from his mom to get baptized as he is 17. I found out that I will be flying home from London alone, so that will be a long flight. On New Year's Day we played soccer. I am living with 3 Elders Elder Quezada who is from Mexico and Elder Almeda who is from Angola and Elder Yeanopolus from the States. 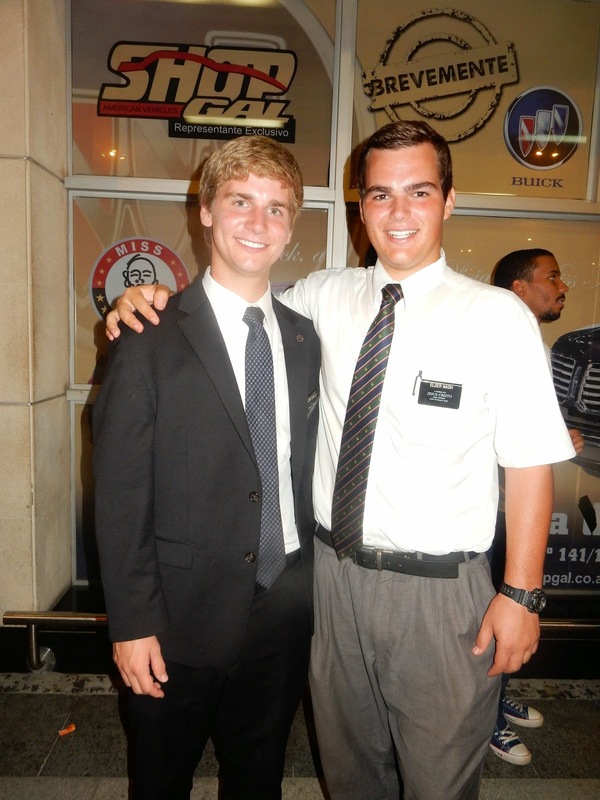 I worked with Elder Almeida when he was just a member in Viana, so that was cool to meet up with him again. 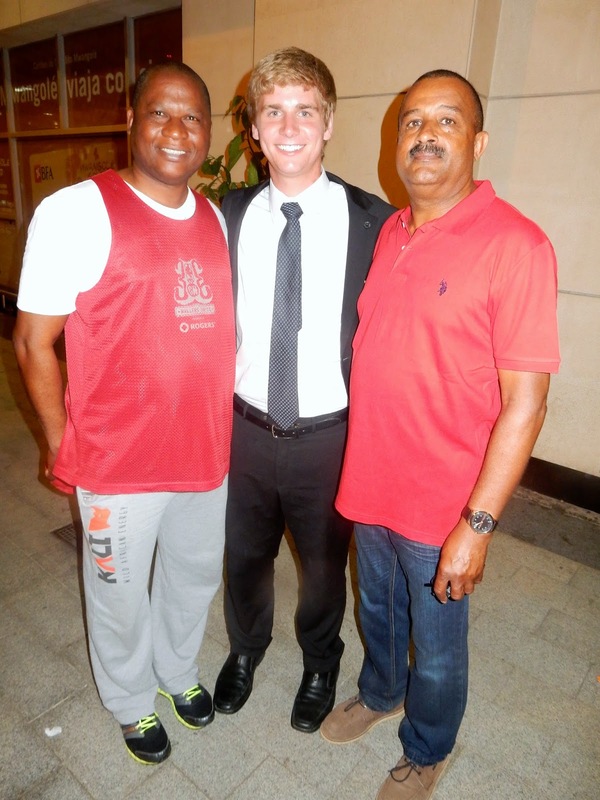 I also had a division this week with Elder Domingos whom I served with in Lubango. It was great to catch up with him and walk together probably for the last time. Church was great as well, I really like the Bemica Branch. This area has huge houses and so its a bit of a change from walking on the trash through the poor neighborhoods to now walking on the sand in the rich neighborhoods. I guess the closer you get to the beach the more wealthy people you can find. We had our Zone meeting, which will be my last, it is nice to be with Elder Yeanopolus as we are on the same page as far as working. We met a guy who is a doctor here and were able to teach him the first discussion on the Restoration, it was a great experience and very peaceful. We are hoping to meet with him again soon. We were able to use the internet at one of the sister's homes in the Branch, which is nice because we do not have to pay for it! She made us food, pizza and noodles. President and Sister Merrill are awesome! We are currently at the President's house right now and Sister Merrill is making lunch for us and then we are going to have a Zone activity. Also we have another lady, named Victoria who is living with a member Jose and they are planning to get married next week so they can be baptized. It seems like we are always having to wait on Marriage Documentation in order for couples to be baptized here in Angola its an on-going situation. One of our members named Jose almost died this week, twice. He got Typhoid fever and his blood turned very dark and his whole body pretty much shut down. His wife Victoria started pouring cold water on him in the bathtub. He was taken to the Hospital and barely made it, but he is pretty tough and made out alright. We have been visiting him daily, he could literally go at any moment. He has been sick off and on. We happened to show up at his house the day he almost died, he told us that today was supposed to be the day of my funeral. I gave my farewell talk here in Sacrament meeting yesterday at church. I talked about the importance of serving a mission. I know I will be giving my homecoming talk in Sacrament meeting there soon too. 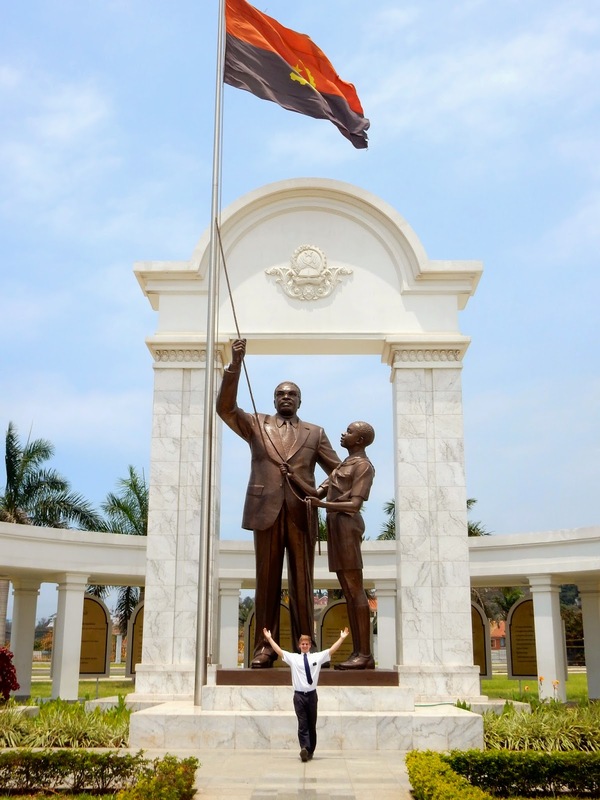 Luisa from Lubango came up to Luanda as her mother had passed away. She called me and wanted to meet up. I got to see her one more time and give her a hug goodbye. That really made my week. Seeing people from Lubango really means a lot, especially that family, they are my favorite family by far...her kids are so fun and they always ask the best questions. I love a good question! She also gave me a gift to give to you, mom. Well that is the main news for the area and the Missionary work that is going on here right now, we are still in the hot season...their summer so I am looking forward to some cold weather there. I am so excited to see all of you again as I prepare to leave next week. 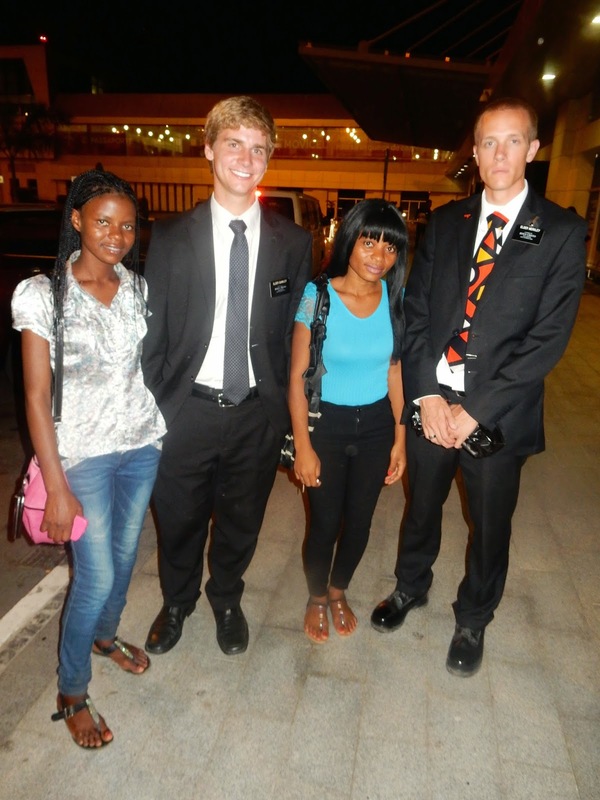 The last week in December I was transferred I am now with Elder Yeanopolus in Bemfica a suburb of Luanda. He was with me in the MTC. I am really excited and we have some great people that we are teaching. I don't think I could have asked for a better ending! It was great to talk with you guys on Skype and after it ended I thought of all these other things I wanted to say and talk about, well it will just have to wait until I get home at least it was a better connection than last year from Lubango. I did not receive the Christmas package yet so hopefully before I leave. This past week we walked with President Merrill and it was really great to be able to take the Mission President with us we will be meeting before Christmas for a celebration with all the Elders. I am really excited to spend Christmas in Cassaquel where I first started my mission! This Week I have been able to share a special message about our Savior Jesus Christ and it has been really uplifting. We also have a new cool investigator named Pagia who want to be baptized already and he said that he will be ready whenever he has been taught all of the discussions, so hopefully we will be able to accomplish that before the end of the month. We played soccer with the Zone this month, it had been awhile since we had a group activity playing soccer so it was great! We are also teaching a really great guy named Gabriel and he is working towards baptism, and another lady named Lu who is working on getting married to her husband before they can get baptized, it is really funny because her little boy keeps interrupting saying mom, mom, mom during the lessons 30 or 40 times without really wanting anything! We recently went to Brother Weggeland's house for dinner and he showed us the video The Gift that the church put out it was really great, you can access it on the church website. I have a view of the ocean from our apartment that looks over the horizon of the city and drops down into the ocean, it is very pretty. I will try and send some pictures soon, these computers are so unreliable from the Internet cafes. I made brownies the other day for a recent convert family for family night and they loved the brownies! This is kind of a surprise because they really don't like sweet things. I also had an opportunity to translate (interpret) for 6 americans this Sunday. Translating allows me to focus more on the talks and what they are saying. more and More Amercians keep coming in, also the new American that served in Brazil is an Assistant to the Missionary Work in the Branch which is really cool to be able to work with him. This past Sunday the power went out and we only had church an hour. That never happens in the states! We only had Sacrament meeting. Birthday! 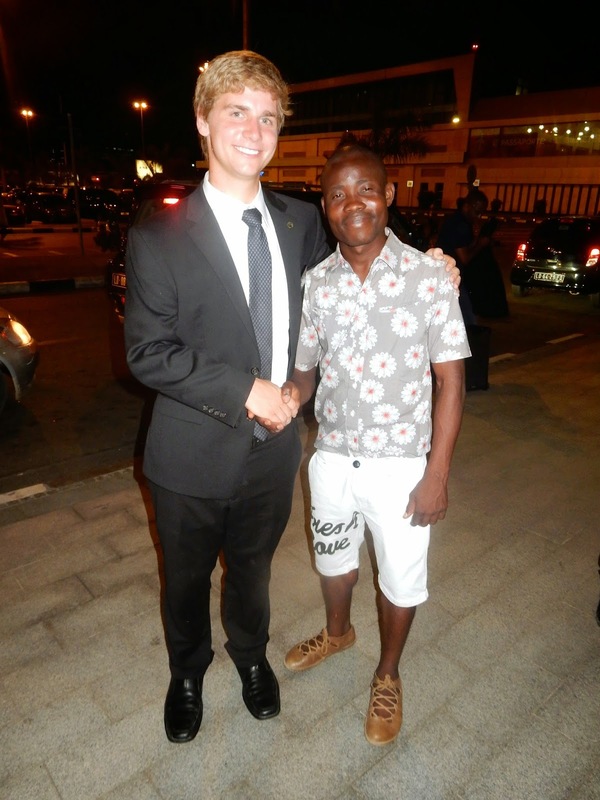 !...Transfer to Luanda...New Companion from Africa...Elder Figuiero!! Happy Birthday Elder Dunkley Nov. 2nd!! This week was a great week and we worked really hard, we are teaching a lot of people in this area. My New Companion is Elder Figuiero and he is from Mozambique, Africa. I am trying to learn from him since he is a native speaker and continually improve my Portuguese. We had some cool things happen this week. We had our District Conference and it was fantastic. We went to the Priesthood session on Saturday and we learned how to be better leaders and then we had a General session with everyone on Saturday night where President Merrill talked about the family and things we can do better here to keep the families more safe and protected and become more united. It was a really great day and then we had the General Conference session the next day. The members from the other Branches that I had served in came and I was able to see some of the members and investigators from some of the other areas. It was so great! I got to see some people from Viana that I really missed and all of Alberto and Claudice's family from The Congo. I got some pictures that I will send. After Conference we all went to the Mission Presidents house to have lunch and we had a nice meal there with Sister Merrill We are teaching some treat people and tomorrow I get to walk with the President and he is going to accompany me for a few lessons which should be a great experience. Happy Thanksgiving Family!! I love you!! I am really enjoying this area, even though Terra Nova had a lot of great memories. We had a lot of lessons this week, it was like good old Cassaquel, for some reason there is always so much work in this area more so than in any other Branch that I have served in. It's been great! We also had a new American family move in, they have 3 little kids, between 5 and 10 and they just run around with all of the African kids yelling in english they can't understand each other! The Dad served a mission in Brazil and is fluent in Portuguese and he works in the American Embassy here. I had to translate all of Sacrament meeting for 5 people through a headset and I will be doing that until I go home. Translating is not an easy thing WOW! T I also got to go to Brother Weggelands and have dinner there, which was so nice, everyone still remembers me from when I was here almost 2 years ago. I was very excited to see everyone and it was a great reunion. Super awesome. Everything you guys have sent has been donated to the people at this point. District Conference is on Saturday and Sunday so that should be great, I am really excited for it. I wish you all a great week! Love you so much! So Transfers this week! I will be going back to Cassaquel but in another area. I will be living in the first house that I lived in when I started my mission. 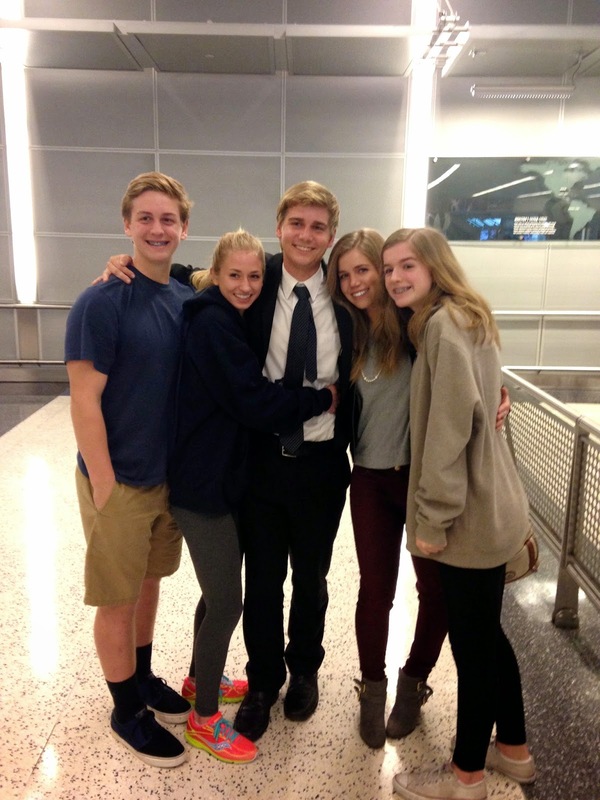 It was great the pictures of Ryan Johnson coming home from Singapore. I am using the Portuguese Plan of Salvation they all love it! It explains it so much better and its a lot easier for them to understand when they have a visual aid and can really see the plan laid out. Thank you so much it works great! Mason you are huge! Jensen you have grown too! Ash you are still the same! Riles you are amazing! Love you bye, sorry its such a short email but I have to pack for the transfer! Hi Family! I loved the pictures and all the emails and YES I did get the birthday packages last week! I loved them so much! Thank you! I was able to have a Birthday Celebration yesterday! It was really awesome and we made the brownies! Conference was great it was long because we watched all 4 sessions at one time. It was nice to be able to understand all of it. For the first time one of the speakers spoke in Portuguese and we didn't have to have a translator and everyone was so into Conference. It is so much better to hear it straight from the speaker and not have through a translator everyone was really paying attention. We are still working with Moises although it seems his family has been trying to convince him not to join the church. We got a call from Jurtrude, Carlos Fonescas wife and she wanted us to come over and help Carlos, he had been drinking for about a week straight and his body collapsed and he was in serious pain. He was in a sweat and in a ball when we came over and we gave him a blessing and let him rest. We came back the next day and his skin was peeling but he was doing much better. It's such a sad situation. I had a great birthday celebration and we went to a Restaurant where they played live music. It was really fun. I miss you all so much! Thank you for the Birthday wishes! Visit to Agostinho Monument...General Conference...The Beach...Moises Commits!!! This week with some of our investigators, Moises has confirmed with us that he will accept the 8th of November for Baptism! Super awesome! So this week he will be getting his interview probably on the Sunday. 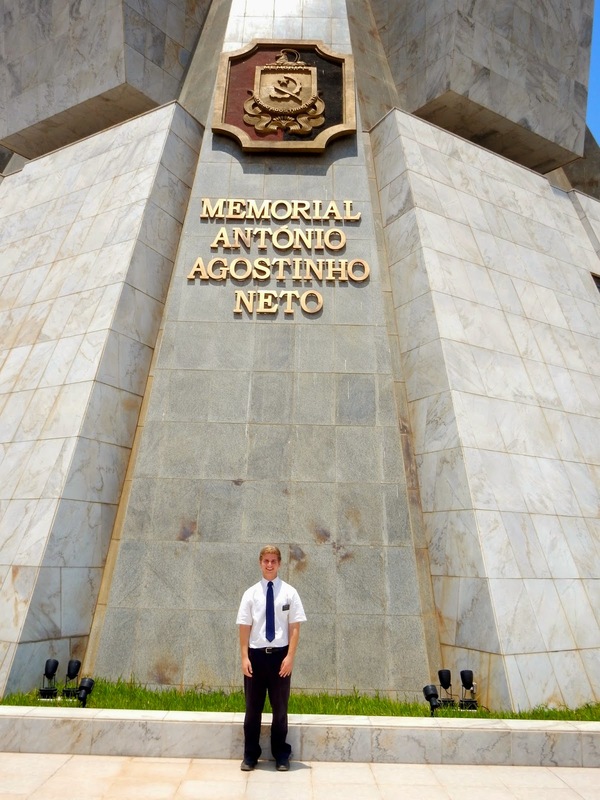 We also went to Agostinho Neto monument where the king is buried. Also we got to watch all the rest of the sessions of General Conference as a Branch. Pretty much all of them yesterday at church, it was like 6 straight hours of Conference, people started leaving early at the end it was so long but it was so good. We also had a Zone meeting where we had a lot of meaningful training. I think I am going to be transferred here in 2 weeks so I’m super excited that Moises will be baptized right before I will probably leave. So Mom, my hand is healed and I am healthy! I think I am getting transferred out of this area soon so I will take pictures of everyone we are teaching. Betinha is doing great, thank goodness she does not need to get married as that is everyone’s situation here! Carlos is struggling with drinking again and we had to go over there because his wife, he was messing up the house. Beer is cheaper than water here about 70 cents so it is a huge problem. So this week Henricks from Lubango, Jorge’s best friend came up to Luanda and called me and so we met up with him and he showed me where his Grandma lives, she is such a sweet nice lady. She goes to her Pentecostal church every Sunday and it was great to hangout with Henricks, he is a really cool guy. The work is going well over here, the area and branch is looking a lot better than when I first got here, and everyone here likes to get up and bear their testimonies. It also gets pretty wild with all of the African Children running around. I try and grab some at a time and calm them down! I can’t believe on everything that I have gone through on the mission. I don’t think I could have done any of it, unless the Lord was guiding me. It is getting a lot hotter over here in Africa…literally very hot so the sunburn from the beach is finally going away now from last week. Realizing my time is short I am definitely not counting the days, just the months. Just kidding, the only thing I am excited for is my own bed and to see all of you guys! So this week we had a lot of great lessons, one person in particular that we are teaching is Betinha and she is 17. She is very smart and we have taught her about the Restoration of the Church, the Book of Mormon and we are going to teach her the Plan of Salvation next. We also set a Baptismal date with our investigator Moises who will be getting baptized on the 8th. I just watched the trailer for “Meet the Mormons” My companion pulled it up on the computer next to me. Can’t wait to see it! Agency is something I have been thinking about a lot recently I never really understood until recently, The Lord will never make anyone do anything. We are capable of making our own decisions about anything. I was really thinking about it and its such a wonderful thing. I am very grateful to have my free agency. This morning I was reading in Alma chapter 62. It was a great chapter when Moroni goes to aid Pahoran and bring back the Kingdom in order and then Teacum is killed after he sneaks into the Lamanites camp and kills their leader. Such heroic men. Well this week was wonderful, great lessons and teaching really cool people. I love the people that we are teaching right now. Also pray for Carlos, we went by his house last night and apparently he had been drinking again. 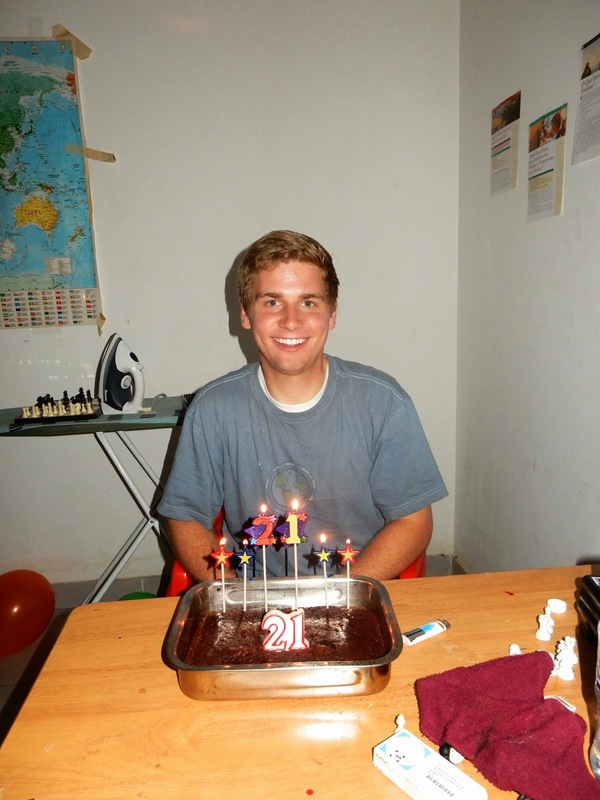 We are also teaching a really cool guy named Hamilton, he is 22. We hope we can challenge him to get baptized soon. I love you all so much!! This weekend was great, we got to watch General Conference and then we went to the beach yesterday, I got really sunburnt, we played football and ran in the sand and had lunch at the beach as well. Positive Ions and Fresh Ocean Air were so nice to have yesterday. Football and Lunch at the Beach in Angola with the Elders! In watching General Conference I noticed that they talked about the Prophet and the Leadership of the Church, and sustaining the Prophet, in deed and in action. I have been reading a lot about the stripling warriors and also about Moroni in the Book of Mormon. Moises is 28 and single and he is progressing we have gone over everything except lesson 4. I feel that he could be baptized here soon. He is wondering if he can be baptized twice since he was baptized in the Catholic Church. Then we go over the Restoration and the Priesthood again.